With accomplished, highly professional and very friendly private music instructors, Music Teacher LA is the perfect place to take violin lessons at any age and experience level. Music Teacher LA founder, Olesya MacNeil, graduated with Masters Degrees in Music, Psychology and Pedagogy and has been providing quality music lessons since 1991. She was a highly sought after private music teacher in Los Angeles, CA and taught the children of Larry King, Billy Baldwin, Dan Beckerman (the LA Kings’ governor), Susannah Grant (the Oscar-winning screenwriter), Bennett Schneir (the animated film producer), and many other Los Angeles families. Olesya assembled a team of unparalleled professionalism, value and teaching experience in Los Angeles who share her burning desire and enthusiasm for quality music education. Learn more about our founder here. Read more about the many benefits of hiring our Los Angeles violin teachers here. Violin lessons bring joy to students of all ages. The violin is a good choice as a first instrument for young beginners because the size of the instrument can be fitted to the child, and it is excellent for developing a good ear for pitch and tone early on. 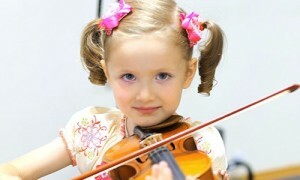 Older children and adults enjoy violin because of its beautiful tone and versatility. The violin is a challenging instrument to learn, and yet as soon as you begin to play simple melodies, you will experience the joy of accomplishment and the beauty of the sounds you are producing. Music Teacher LA offers violin lessons from world class violinists for students from 5 years to adults in traditional or a blend of Suzuki/traditional methods. 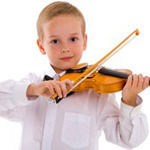 Our Los Angeles violin teachers will focus on materials that are appropriate for young, small hands and bodies such as easy melodies and songs that the student wants to learn. 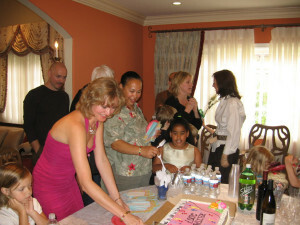 More experienced students master significant repertoire and develop advanced technique. We provide the best comprehensive violin lessons in Los Angeles that include music theory, ear training, sight reading and more. Recommended practice time can be anywhere from 10 minutes for a very young beginner to several hours for an advanced adult. Each student will need an instrument to practice at home. Music Teacher LA offers assistance in determining the size of the violin for your or your child and purchasing or renting an instrument. Our Los Angeles violin lessons are offered seven days a week in the comfort of your home. Contact our dedicated violin teachers today!